Sheet metal fabrication is a complex process which uses sheet metal to build metal structures and machines. Those specializing in this process are known as ‘fabrication shops’. This involves the burning and cutting of sheet metal with specific band saws and chop saws so that the cutting is done evenly. Cutting torches can be used for cutting sheet metal of large sections with minimum effort. Using hydraulic brakes for sheet metal fabrication, bends and angles which are predetermined, can be created with ease. Rolling machines are used for around sections of the metal. Different metals like tin, copper, brass, steel, titanium, and nickel can be fabricated into sheet metal. 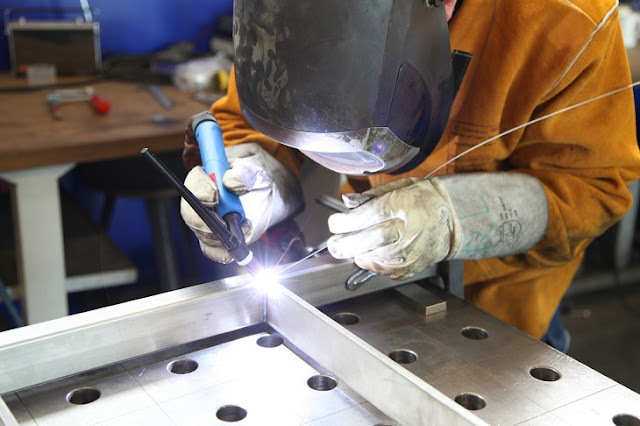 Welding is used for tacking the sheet metal into place. Different techniques are made use of so that there is no warping or any defects. This includes welding in a staggered manner with the metal being sand covered while cooling. Special processes are used for straightening. This is achieved with the help of an Oxy-acetylene torch. Warpage, if any, is removed by application of heat in a slow linear manner. Shipping is done after the inspection is completed. Using the latest technology of CAD/CNC and CAM this sheet metal fabrication is done efficiently and accurately. With the help of a punch press of the CNC metal sheets are positioned and accurate holes of a specific tolerance are punched. Using CNC electric and hydraulic presses metal sheets are formed into the required shapes and sizes. Though sheet metals are strong they can be shaped in accordance to the requirement as they are malleable. This works ideal for designers and architects. With painting, priming or sand blasting these sheet metals are made durable. This process helps in increasing the resistance to moisture, sun and corrosion. This sheet metal can thus be used in various applications with no risks involved. This fabrication helps in saving the transportation costs as they are light weight with a gauge of 0.5mm. As mentioned earlier, they seem to be apt in a number of applications. Repairing of these sheet metal is easy once the damage is detected. All that is required is the removal of the individual sheet from a specific structure and replacing the same without any need for dismantling. The ease of transport, durability, design and more contribute to the low cost of sheet metal. You get the required product of the desired quality at an affordable price. You need to make sure the sheet metal fabricator you are opting for has the required experience and knowledge of the different metals. Each metal requires different skills, finishes, tolerances and more. It is important to know that each metal has a different process for sheet metal fabrication. Besides the above, you need to ensure that the shop chosen has all the required equipment as this process requires a wide range of equipment. All the metals require specialized tools for the fabrication. A shop requires CNC programmers who are well experienced in this process. It is team work that will get you the results you are looking for. The team includes engineers, programmers, designers and so forth. A well reputed shop will work within the deadlines given and the work will be done with accuracy and precision. A careful research is a must before you settle on a sheet metal fabricator for your requirement. You have the option of searching online if you are unable to get reference from similar businesses or friends. Each shop specializes in different metal fabrication; you need to find one which can cater to your need.